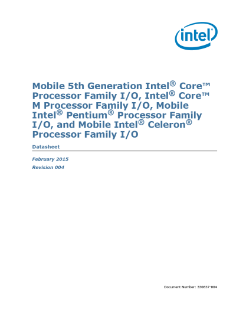 This document is the Datasheet for the mobile 5th generation Intel® Core™ processor family I/O, Intel® Core™ m-series processor family I/O, mobile Intel® Pentium® processor family I/O, and mobile Intel® Celeron® processor family I/O Platform Controller Hub (PCH). The 5th generation Intel® Core™ processor family, Intel® Core™ m-series processor family, mobile Intel® ...Pentium® processor family, and mobile Intel® Celeron® processor family are designed for a one-chip platform. The processor includes this low-power PCH die that is in the same package as the processor die. This document is intended for Original Equipment Manufacturers (OEMs) and BIOS vendors creating products based on the 5th generation Intel® Core™ processor family, Intel® Core™ m-series processor family, mobile Intel® Pentium® processor family, and Intel® Celeron® processor family.